Rookie tucked up under my sewing table. If I am LUCKY, he will not try to climb my body! it was getting light and FINALLY, he settled down. I slept until around 8 am...and then I could not stand it anymore. Poor puppy! 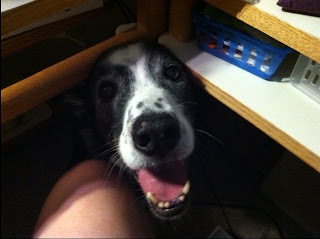 Our Callie is not a fan of thunder or firecrackers. Her favorite place to hide is in my closet, in the corner, behind the lower rack of skirts and long blouses. Poor Callie is a stress monster July through the end of monsoon season. We do give her a couple of benadryl (sp?) pills that help a bit to calm her down.